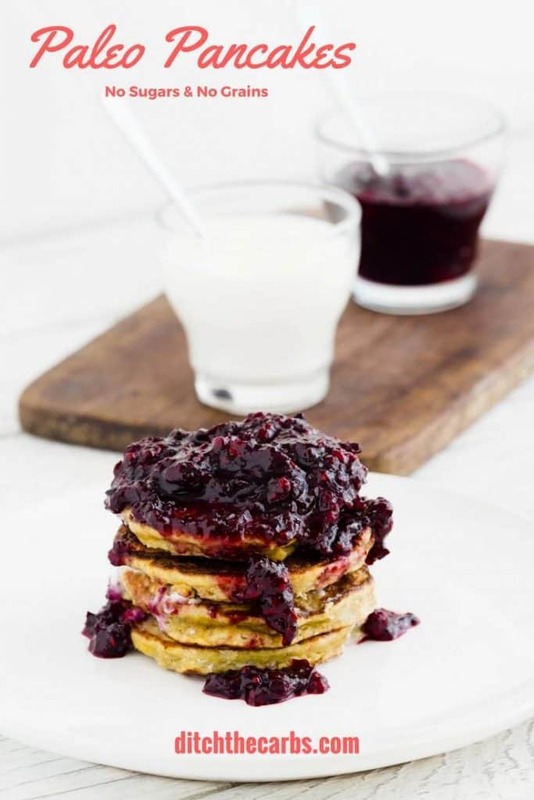 4 ingredient, Paleo Pancakes - sugar and grain free. 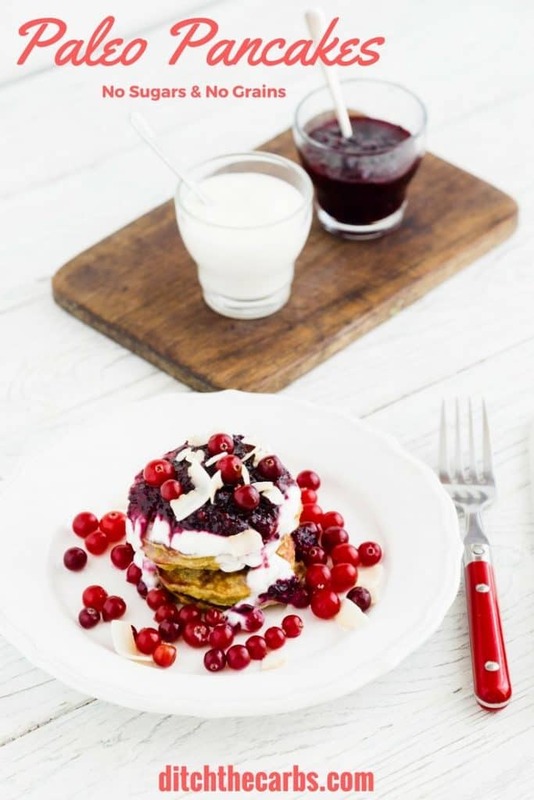 Paleo pancakes are superb for beginners. They are pretty much fail proof. 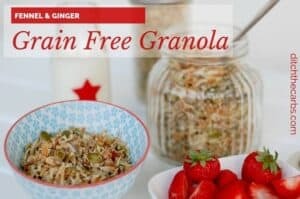 They have no added sugars, grain free and gluten free. Paleo pancakes are higher in carbs than most low-carb pancakes but are mainly for my children who adore them as a treat. The emphasis for my children is to eat unprocessed, real food. They are low carb not no carb. 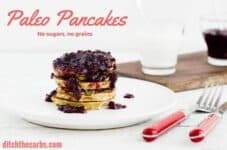 The average store bought pancake is 28g per pancake compared to under 7 g net carbs for paleo pancakes (then there is the maple syrup and toppings to consider also). 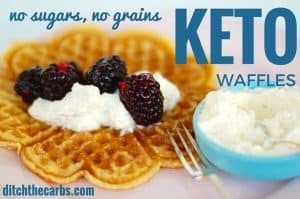 If you would like a lower carb version, why not take a look at my keto waffles. It won me a “keto goddess” waffle award so they must be good. 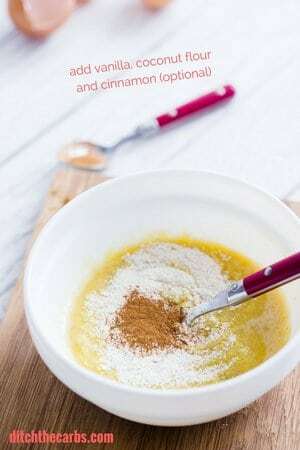 This recipe only has 4 ingredients (the cinnamon is optional) and can be doubled, tripled etc. 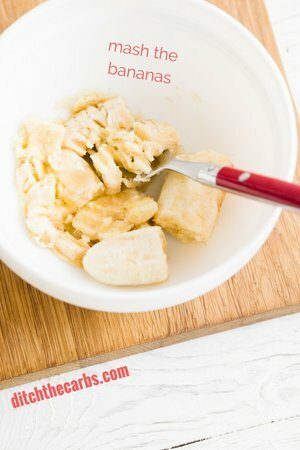 I usually make a double batch of paleo pancakes for a weekend breakfast or to keep for school lunches. 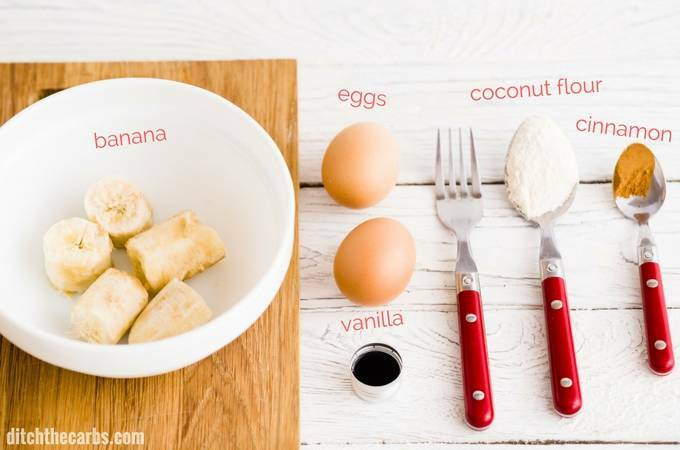 Simply mash the bananas with a fork. Add the vanilla, coconut flour, and cinnamon (optional), mix again. Allow the coconut flour to sit and swell with the eggs. This makes for a sturdy paleo pancake. This also makes them easier to flip in the frying pan. Serve with coconut cream and berries. If you are not paleo and can tolerate dairy, serve with cream cheese, whipped cream or even melted butter. Paleo pancakes are a wonderful breakfast idea when you are trying to wean your children off processed store bought pancakes or sugary cereals. Paleo pancakes are dairy and gluten free. Perfect for a longer breakfast at the weekend. They are a little higher in carbs but the kids love them. Add the coconut flour and vanilla, mix with the fork then let to sit while the coconut flour thickens the mixture (do not miss out this step otherwise they will remain runny and hard to flip). Heat a frying pan and add coconut oil to fry small batches until cooked evenly on both sides. I cook them on a slow heat but for a bit longer helps the mixture dry out and 'set' like a regular pancake. We like to enjoy them with berries and coconut cream. Recipe makes 4 small pancakes. Nutrition panel shown, is per pancake. Are you droning yet? 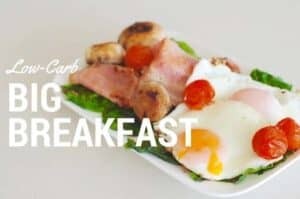 Take a look at my other breakfast ideas below. All are low carb, grain free, gluten free and no added sugars. 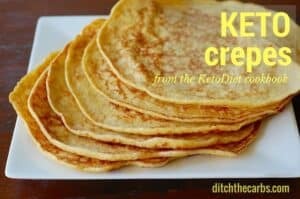 I have made A LOT of paleo pancake recipes. This one is THE BEST!! Thank you! 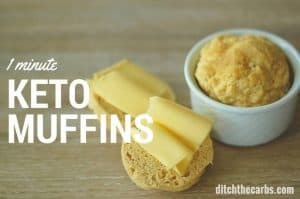 Where can I buy almond flour. 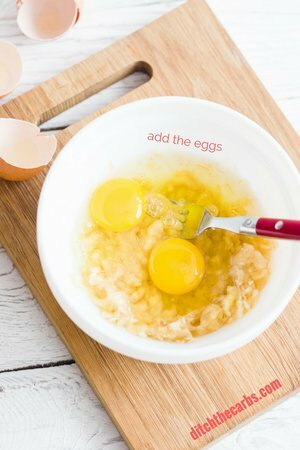 Take a look at my Low Carb Keto Shop – everything you need to start and stock your pantry. These were great Libby.Seeing I’m on sugar free September I was craving carbs as my go to sweet thing, 85v% chocolate, is off limits as it too has a little suagr in it from memory.. The half a banana in my portion I shared with my husband won’t hurt. Had Greek Yoghurt and strawberries with them and am full and satisfied. BTW this recipe made 8 small panckaes (I call them pikelets). You could use psyllium husk powder instead of coconut flour. You could but that would be another recipe entirely. Coconut flour and psyllium husks work in different ways – read this post, it will explain it. You could start but adding psyllium until it thickens to the desired consistency. For a lab experiment, I actually added in a serving (1 tsp) of psyllium husk powder and still kept the coconut flour in. The consistency did turn out slightly thicker, but the taste was about the same and 4g of extra fiber was added! Just made my third batch of these. Total winners. Thanks Libby. One year ago I could not eat coconut flour but now my gut has healed and I can enjoy treats like these. Love them with Greek yoghurt and berries. This is fabulous. Not only has your gut healed, a whole new world of recipes has opened up for you. Food processed pork rinds and eggs work well for a batter. No pork taste at all. Hi there. Just wondering…so you’re saying that this recipe serves 4 people and each pancake has about 8 carbs, right? Yes. It makes 4 medium pancakes. They are higher in carbs than most low carb pancakes. 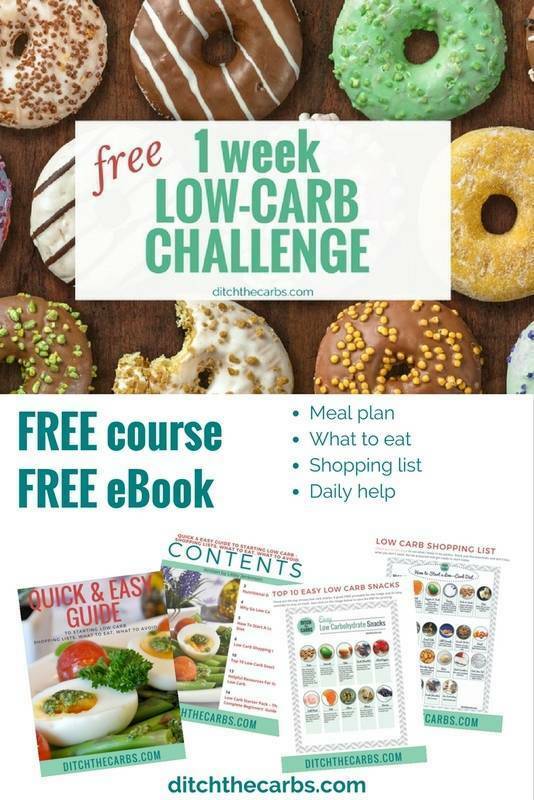 I have just updated it and added some lower carb options. These are made for my children who eat higher carb than I do. 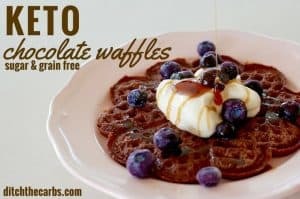 Try my keto waffles for a low carb delight. I noticed some of your recipes contain coconut flour for the binder ie; pancakes, could you also use almond flour in it’s place. No they have different properties, but maybe I should make an almond flour pancake recipe next? I cannot buy coconut flour anywhere. Where do you buy yours. You can buy it on Amazon (this is the link to my Low Carb Keto Shop) or here in NZ I buy it at my local supermarket. These were lovely! I added some cacao nibs and then topped them with whipped cream and fresh blueberries. This didn’t work for me at all. The pancakes didn’t hold their shape at all. Let the coconut mixture ‘sit’ for a while to allow the coconut flour to absorb the liquid, or add another egg to hold it together. Cook slowly too. Or try my coconut pancakes, they seem to hold together well. I didn’t have coconut flour but I have almond flour so used it instead. The pancakes are difficult to turn and are not pretty like your picture but they are delicious with cream cheese and berries! Sadly banana Spikes my Blood Glucose Level…… is there a way to make these that fit into Low Carb? Yes, try the blueberry coconut pancakes which have no bananas. They are based on eggs and coconut flour.